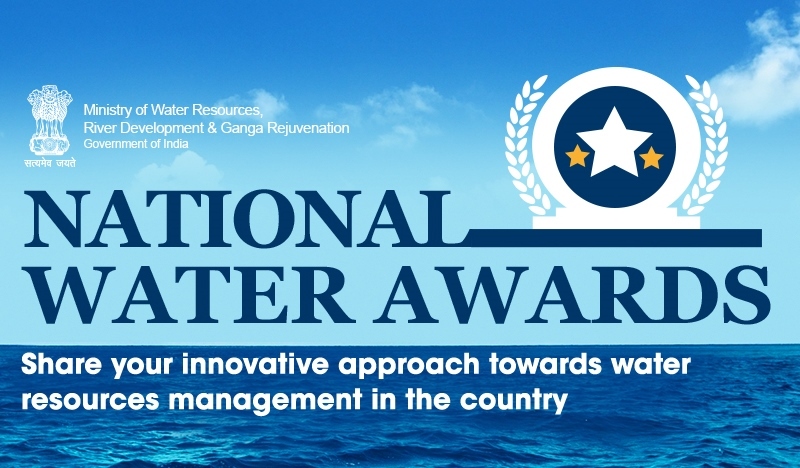 The National Water Awards is a Scheme of the Ministry of Water Resources, River Development & Ganga Rejuvenation. The objective of the Awards is to encourage all stakeholders to adopt holistic approach towards water resources management in the country. The National Water Awards along with the Ground Water Augmentation Awards and were launched in the year 2007. All stakeholder including the Non-Governmental Organizations (NGOs), Gram Panchayats, Urban Local Bodies, Water User Associations, Institutions, Corporate Sector, Individuals etc. were invited to nominate themselves for adopting innovative practices for conserving and augmenting water resource. These include ground water augmentation by rainwater harvesting and artificial recharge, promoting water use efficiency, recycling & re-use of water and creating awareness through people’s participation. The Ministry is now inviting applications from Resident Welfare Associations (RWAs), Municipalities, states, institutions, industry, media houses and all stakeholders for nominating themselves (and others) for the National Water Awards 2009. The last date for submitting nomination is 31 July 2019. If your RWA, institution, media house, etc. has taken considerable initiatives towards water conservation, this is your chance to speak out! Applicants shall download application forms for the respective category by clicking here. Duly filled and signed application form shall be uploaded on the MyGov website by clicking here. Water is one of the vital components of life. Rapid urbanization and industrialization has put enormous stress on water resources. This has led to water scarcity in many regions of the country. Further, climate change has resulted in unpredictable changes in water-cycle in the country. This makes it necessary to protect water resource as well promote its efficient use. This is the motivation behind conducting these National Water Awards.